Unsocialized: 10 years ago... "Make Capitalism History, Bono. Make Capitalism History..."
10 years ago... "Make Capitalism History, Bono. Make Capitalism History..."
Two things changed in my life in 2005. One of them has had a lasting effect on my life, the other means I listen to irish pop and rock with a cynical ear. I started my year off with the customary play of U2’s “War” Album, with the wonderful album version of the song, New Years Day. By the end of the year, that personal tradition had changed because of how let down I felt (though I have to admit still loving the track…), and Rat Trap, by the Boomtown Rats also fell from my playlist. My memories of twenty years before, 1985 and the Live Aid concert was sullied and I knew because of Bono, Geldoff and Blair, a ultra right-wing corporate world was inevitable. If anything, this was to be Scotland’s practise for what happened on the lead up to last year’s referendum. The hope and the gathering of many campaigns under one slogan – a slogan I was attracted to, but a slogan I knew carried a caveat. A very important one – Make Poverty History was not possible without making capitalism history. And some of us knew that Blair, Brown, Bush et al had no want to do that no matter how many white teeshirts Richard Curtis sold. Last year’s Yes campaign took on the social justice, anti-nuclear and pro-immigration mantel of the Make Capitalism History campaign I had been part of. I remember going to dusty halls in Glasgow to learn about what to do if arrested as an activist, what the Police were likely to ask, what I should answer and what they didn’t need to know. I remember going to public meetings, hosted by various left groups, all united in the want for a better world. A world in which poverty died, not killed. A world where equality, freedom and social justice was the goal – not war profiteering, Reaganomist, Thatcherist, neo-liberalist, neo-conservative, corporate globalisation. And I drank many pints in bars discussing the future of the capitalist world, how to make poverty truly a memory. And I drank manys a can of Stella whilst arguing, debating, discussing on online forums. 1999 had been the turning point for many. The kick back. The day when Seattle taught us how to expose them and expose their creed and greed. Seattle ’99 – people remember it as when the new left emerged. Then came their turning point, 9/11, and their wars. But we fought back. This was Scotland’s Seattle ’99. This was to be our generations George Square 1919. And boy, like the fight for the 40 hour week, did the elites throw everything at us (bar tanks). This year, the media will remember 7th July 2005. A dreadful day in London. A day when ordinary people lost their lives to murderous bastards. I will remember that, standing in a bar in Gran Canaria watching events unfold while other pint swilling brits droned on about how these muslims should be put in their place. I was too hungover to react too much to their nonsense. I did say, and it was a coat getting moment, that this was going to mean many, many more innocent lives sacrificed in Iraq and Afghanistan. But I will also remember the beautiful moments when we all came together in Scotland to fight against the elites who want us to be in perpetual war. I will remember the many millions of lives still blighted by the Blairite reaction to 9/11 and 7/7. I will continue to shine a light on the elites who make millions on the back of death, destruction and poverty. 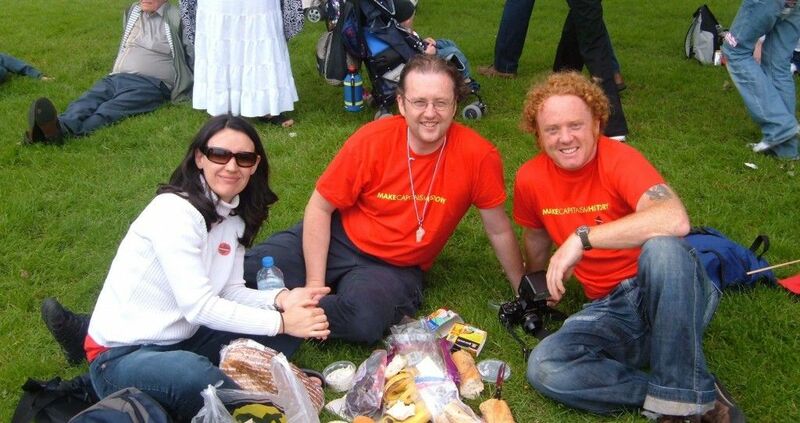 And I will also remember the 2005 buffer between truth and the Blairite cave in to corporatism – the Geldoff’s, the Bono’s and the Richard Curtis’s who told us - we - who did not rely on clicking fingers and slogans for our fame, were bad protesters. 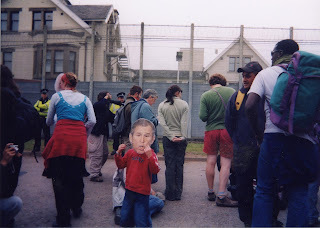 And they clicked their fingers and told us children would die if we didn’t support the war criminals Blair and Brown behind the barbed wire and dog patrolled perimeter fences at the luxury Gleneagles Hotel. And they told us by wearing their brand of enclosed protest, we would Make Poverty History. The millions who joined in the clicking fingers and wearing the white teeshirts and white rubber bands did not make poverty history and I don’t blame them for believing that they were part of something that could. Hope is a word, an aspiration that led to the Obama administration blasting weddings and families in poor Afghanistani and Pakistani communities with drone weapons. The demonstrations organised (and some that were taken over) by Geldoff and his egotist followers did manage to do a few things. They drew attention to the fact at just how helpless we are in the face of the banking and billionaire takeover of our democracies. The 2007/8 economic crashes and the subsequent impoverishment (and profit making from impoverishment) of the Greeks and other nations have again drawn attention to who are controlling us. The demonstrations organised by a tired Geldoff also brought together groups from across the Country – and indeed, across the world and exposed them to the arguments many of us had been trying to put to them for years. But their festivals/ rock concerts became nothing more than a second rate Live Aid, were nothing would be remembered by many only the white teeshirts, the branding and the dreadful regurgitation of “Let them Know it’s Christmas time agaiiiin…” months later. The experiment in corralling and taming protest worked. The hope was defeated and the failure blatant for all to see. Our message that you could not make poverty history without making capitalism history is as true today as it has been in the nearly 300 years history of the system that replaced feudalism. The Scottish Socialist Party, of which I was and still am a member, were key in organising demonstrations across the country – demonstrations that brought people to key places where making capitalism history would have a huge impact. 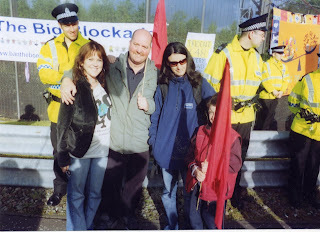 We had huge demonstrations at Faslane. 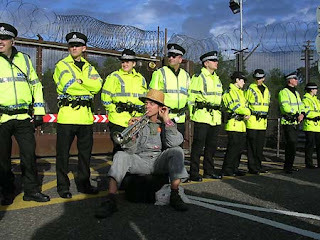 I witnessed my first experience of kettling at Dungavel removal Centre. And we cut a red swathe through the white river of concert fans and Live Aid nostalgia. 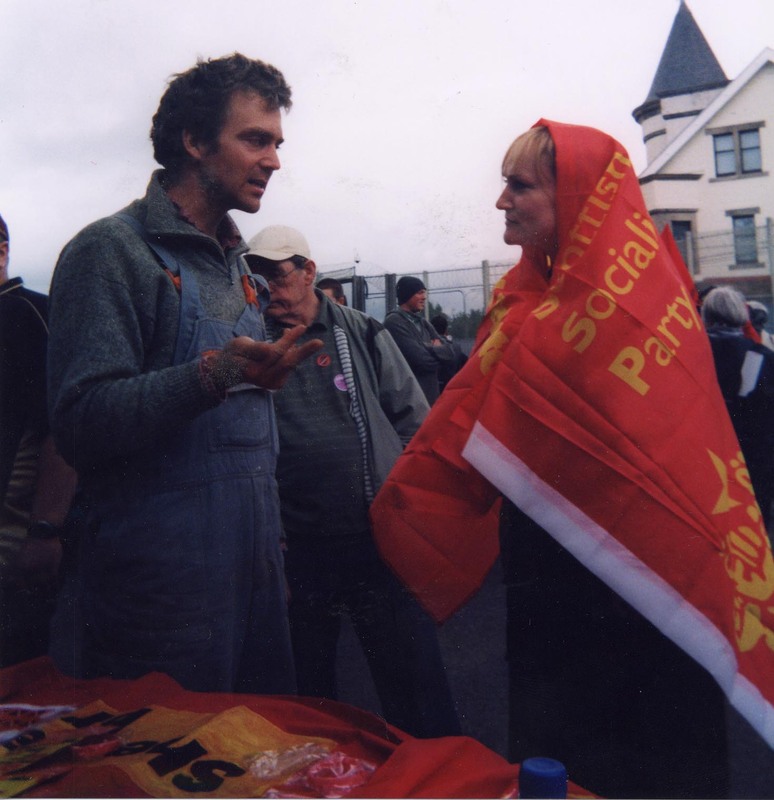 And after every demo, I had a great political conversations over a few pints – and on a few of those occasions, I managed to persuade people around us, including barmen and women, to go to Auchterarder to shout at the G8 leaders. I played "New Years Day," the sublime album version, on January the first this year. I have kind of forgiven Geldoff and Bono. Bono because of his awakening many young teenaged irish people to another way (as did other bands like Stiff Little Fingers) and actually brought busloads of us together, catholic and protestant in places like Croke Park and the Ulster Hall, and Geldoff because of his great wee pop-punk song about living in poverty, "Rat Trap." But they were very wrong in taming the anti-capitalist, anti-poverty movement. One reaction to me wearing my red teeshirt emblazoned with “Make Capitalism History,” at the Geldoff/Bono/Curtis white out in the Meadows of Edinburgh was from a young, trendy looking guy who said to me – “Why are you spoiling this by politicizing it?” I couldn’t think of an answer quick enough for two reasons – one, incredulity and two, I was nursing the worst hangover in history until that point. And it was at that point I decided I needed a rest from the booze. It was impeding my activism… and later that year I went off it for a year. A few years later, this led to me giving it up completely. And there is the thing that has stayed with me ever since. My activism will never be at full tilt while nursing a hangover.